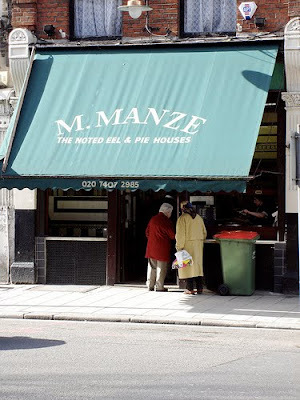 There are three Manze's Eel and Pie Houses in Greater London. The business has remained in the same family for over 100 years and still use the same recipes today for the pies and liquor as were used when the current owner's grandfather, Michele Manze, opened his first shop. Manze arrived in Britain from the hillside village of Ravello in Southern Italy in 1878, at the age of 3. The Manze family settled in Bermondsey, first trading in ice and ice-cream, with Michele branching out into the pie, mash & eels trade in 1902, when he acquired his first shop from the legendary Cooke family, as it had been established in 1891 by Robert Cooke. This shop, at 87 Tower Bridge Road, Bermondsey, is open to this day, and as such it claims to be the oldest eel & pie shop in the world. It was joined by a second shop at 250 Southwark Park Road, Bermondsey in 1908 (now closed), and two further shops in Poplar, which were lost during World War Two. A fifth shop at 105 Peckham High Street was opened in 1927. A final shop is at 226 High Street, Sutton. Only the Tower Bridge Road, Peckham and Sutton shops are still open today. It is a fantastic history, but your author finds the eclectic list of celebrity endorsements equally intriguing. Did you know that Janine and Sonia from 'Eastenders' were interviewed for 'Heat' in the Tower Bridge shop? That Roy Orbison, Jim Davidson, Danny Baker, and David Beckham are named by the owners as regulars? That Jono Coleman once hosted the Heart Radio breakfast show from in the shop? and that Rick Stein once filmed a 'Rick Stein Food Heroes' here..? Did you care..? Thought not. 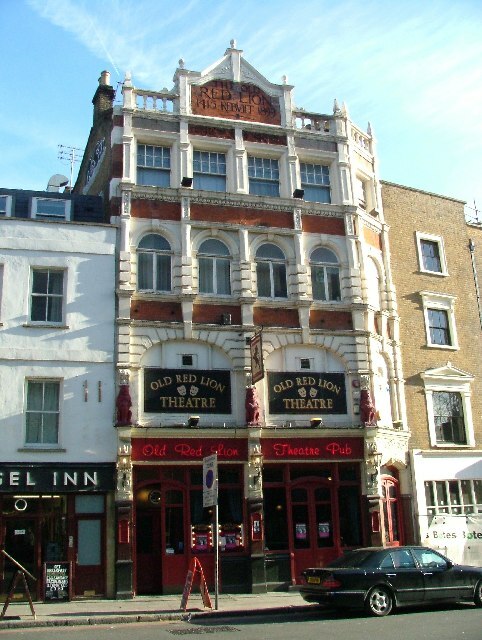 The Old Red Lion Theatre, is a small theatre above a pub close to Angel Tube Station. Whilst the theatre organisation was only founded in 1948, as a theatre club, the Old Red Lion pub is apparently one of the oldest in London, having been built in 1415, but rebuilt in 1899. The relatively small 60 seater fringe theatre opened properly in 1979 a small studio above the main bar pub's first floor, giving the pub its present name of the Old Red Lion Theatre Pub. The theatre specialises in works by new writers. 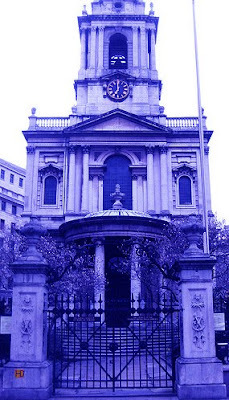 At the centre of one of the oldest parishes in London, St Mary le Strand now stands on a traffic island in the middle of a roadway which since prehistory has been the main route to the west from the City of London. We are told that in early Saxon times this was the very heart of London, and from the traffic volumes which rush past the church, it appears it still is. There is, apparently, no record of when the first St Mary le Strand was founded, but the original church was just to the south of the current site, beneath what is now Somerset House. That church was knocked down in 1549 in order to build Somerset House, and a promised replacement never materialised. Wikipedia tells us that the site of the modern church was formerly occupied by a very pagan great maypole which was used for May Day festivities in the 16th and 17th century. It wasn't until 1714 that construction began on the new St Mary le Strand, as the first new churches built under an Act of Parliament, passed for building 50 New Churches in the fast expanding suburbs of London. 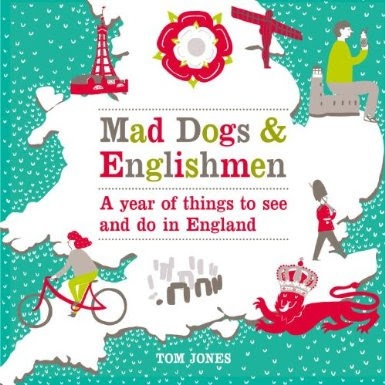 Since then, notable events apparently include the renunciation of the Catholic faith by Bonnie Prince Charlie on a secret visit to London in 1750, and the marriage of Charles Dickens' parents in in 1809. 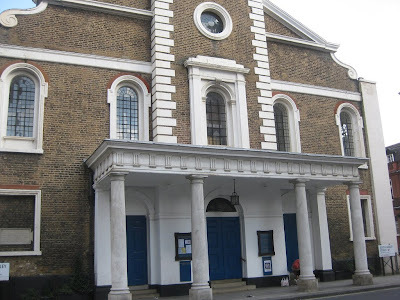 The church also escaped the Blitz and plans to demolish it and widen the Strand. Constructed in 1963 and designed by Ronald Ward and Partnerst, Millbank Tower on Millbank around half a mile South of the Houses of Parliament and just North of the Tate Britain is a 387 ft tall Grade II listed skyscraper in the City of Westminster. The tower is well known for being the location of the offices of political parties, and the Labour Party famously based its offices there in the run up to the 1997 General Election. Nowadays, the Conservative Party have relocated their Campaign Headquarters there, hoping to repeat the success of Labour in 1997. 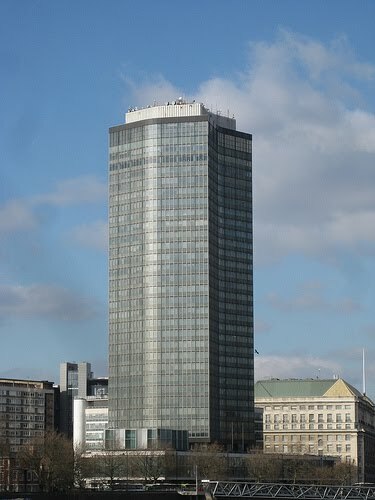 The United Nations also apparently had offices in Millbank Tower until 2003, when they left due to high rents. Nowadays, the various floors are occupied by the likes of The Parliamentary Ombudsman, The Specialist Schools and Academies Trust, The Local Government Ombudsman and The Ministry of Justice Records Management Service. Your author imagines they are all just as interesting as they sound. Have you ever noticed how at the weekend, when less people read blogs, your author tends to do posts about boring statues? Well, on the steps between the Foreign and Commonwealth Office and HM Treasury, overlooking St James' Park, is a statue to Major-General Robert Clive, 1st Baron Clive, KB, better known as Clive of India. 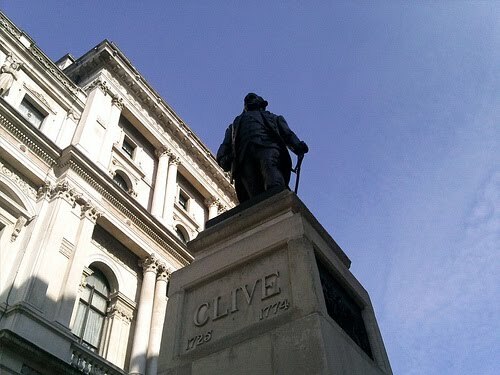 Born in Shropshire, Clive was first sent to India in 1744 at the age of 19, and went on to be largely responsible for establishing the military and political supremacy of the East India Company in Southern India and Bengal. This effectively secured India for Britain and, together with Warren Hastings, he was one of the key figures in the creation of British India. Following a number of trips, Clive eventually returned to Britain permanently in February 1767, subsequently moving to Claremont, a large house in Surrey, in 1769. In November 1774 he committed suicide at number 45 Berkeley Square, where he then lived, by stabbing himself with a pen-knife. This was thought to have been linked to his history of depression and to opium addiction, as well a more immediate illness which left him in excruciating pain. 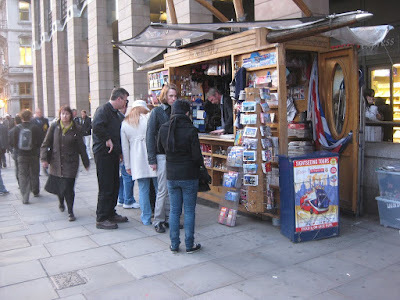 Even MPs need to buy a newspaper, and the tiny news stand, on Bridge Street, SW1, provides all the newspapers daily for MPs in the Houses of Parliament, as well as passing civil servants, and serves a dual role supplying inane tourists with directions and pieces of tat. It's a mammoth operation, and so is the invoicing of the 600 odd MPs who order papers daily and need to ensure they are properly invoiced. For a while the stand was temporarily relocated onto the South footway of Bridge Street, but was returned to its natural home on the North side in 2005. So whether its a novelty postcard of the Queen's face, a copy of the Wall Street Journal (selected stockists only) or a copy of any bog standard daily paper you're after watch out whilst your in the queue, as you might spot a Minister of the Crown queuing up to change his paper order. Your author doesn't usually go in for boring graffiti posts, but there will always be exceptions. So today, let's look at the work of the graffiti artist Ben Flynn (aka Eine), or more specifically, some work he did quite a few years ago, in Shoreditch, Hackney and Brick Lane. 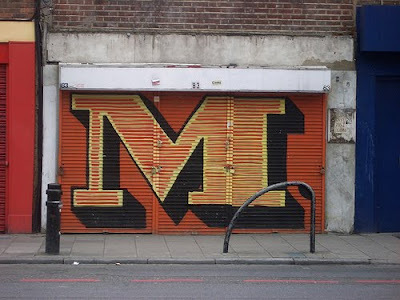 For it was Eine who covered dowdy shop shutters with vibrant letters. 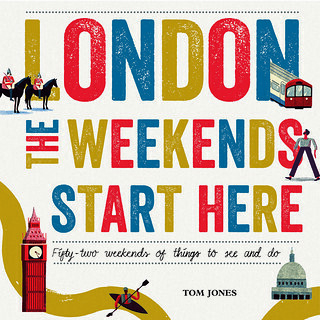 They've been around for about five years now (probably) and Eine has also taken the concept to Paris, Stockholm and Newcastle upon Tyne, as well as Hastings in East Sussex, where your author was pleased to find some last weekend. Eine has also been involved in some larger lithography projects such as the larger-type SCARY, which adorned the wall on Rivington Street in central Shoreditch. For more about the letters, see an interview at http://www.ishotthedeputy.com/?q=node/570. 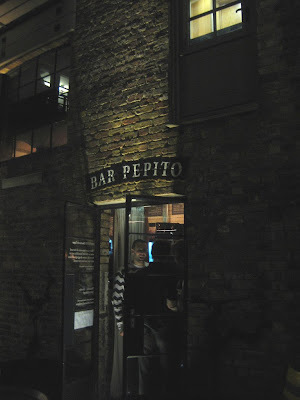 Your author was invited to the opening of Bar Pepito, London’s only dedicated sherry bar, last week, and it was jolly pleasant. The tiny bar bills itself as 'a must visit for any sherry lover' and stocks plenty of different types of sherry. The focus of the bar is, we are told, on bringing an authentic spirit of Jerez to Kings Cross, and it is nice enough. Calling it a bar in its own right is a bit of spin as the space, sat in shiny Varnishers Yard, is technically an offshoot of Spanish restaurant Camino. However, it just about holds its own (even if you do have to pop over to the restaurant to use the toilets), serving sherry and tapas from a menu designed by Camino head chef Nacho del Campo. Your author must admit he was basically a sherry novice on arrival but the experience was rather pleasant even if he couldn't hack the sweet sherries for long. In order to help you to experience all the different types of sherries, they've even installed one of those new Enomatic machines (like at the Sampler and Bottle Apostle). It's an open stainless-steel chiller cabinet holding eight bottles of sherry, allowing you to try a tasting amount of several different types, without having to take on a full glass. The Musical Museum, in Brentford, is, apparently one of the world’s foremost collections of automatic instruments. Your author has never been, but if you're into that sort of thing this is for you. From the tiny music boxes to the self playing ‘Mighty Wurlitzer’, the collection brings together the best in reproducing pianos, orchestrions, orchestrelles, residence organs and violin players. 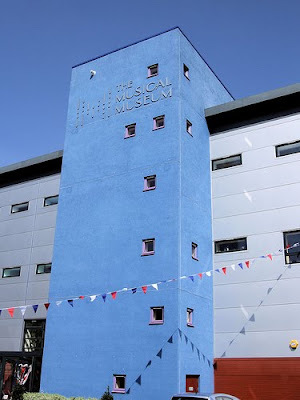 The Museum was founded in 1963 by the late Frank Holland MBE who wanted to preserve the self-playing musical instruments. It reopened in late 2007 in a three storey building on Brentford High Street, complete with 230-seater concert hall and the world's largest collection of historic musical rolls. The Victoria, on Uxbridge Road in Shepherds Bush, is a former Victorian Gin Palace, Princess Victoria, restored by Matt Wilkin and James McLean and named ‘Timeout Best New Gastro Pub 2008’. Considering the location, its a surprise that only on half of the duo is from the Southern Hemisphere and it is Matt, originally from Adelaide, and previously Executive Sommelier at the 2 Michelin starred Capital Restaurant, Matt has won awards including UK Sommelier Of The Year 2005. Head Chef, James, meanwhile won ‘Young Chef Of The Year 1997’, formerly worked at of The Greenhouse and The Goose in Oxfordshire, and is now focussing on good British food. Having said all this, your author has only actually ever been in for a pint but it was a very pleasant spot and considering the above, it could be worth investigating the menu next time, and as if that weren't already enough, we are also told there is a courtyard herb garden, a wine & cigar shop and a weekly artisan market. Let's just hope they're not over-stretching themselves. The Princess Victoria is at 217 Uxbridge Road, London W12. 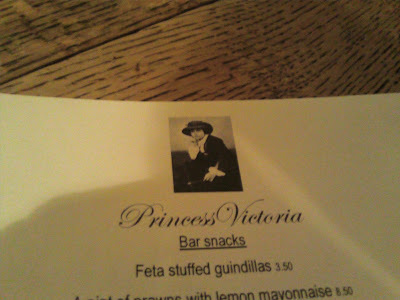 For more information, see http://www.princessvictoria.co.uk/, or for perspective, see fancyapint. 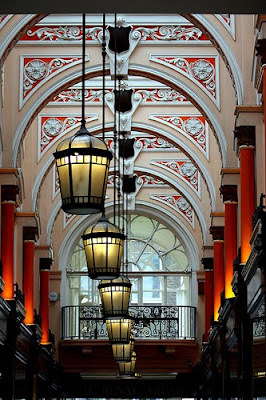 Built in 1879, the Royal Arcade in Mayfair links 8 Old Bond Street with 12 Albemarle Street. Originally known as "The Arcade", it was renamed "The Royal Arcade" after Queen Victoria bought some items from a shirtmaker named H.W. Brettell, who had opened his Shirtmakers at Number 12 the Arcade in 1880. The arcade's freehold is apparently owned by a trust in the name of Reginald M Phillips, who was a Brighton based property developer, philanthropist and award winning stamp collector who donated his collection to the nation. Constructed in the 1730s, Grosvenor Chapel, on South Audley Street in Mayfair, was apparently the inspiration for many churches in North America. It is also notable for the transformation of the interior which was carried out by John Ninian Comper in 1912-13. The first stone was laid on 7 April 1730 by Sir Richard Grosvenor, who owned most of the buildings in the area, as his descendants continue to do by birthright. Grosvenor leased the site for 99 years at a peppercorn rent to a syndicate of four “undertakers” led by Benjamin Timbrell, a prosperous local builder. When that lease ran out in 1829, the chapel was brought within the parochial system. During the Second World War, the chapel became a notable place of worship for members of the American armed forces, who were welcomed to the Chapel for their Sunday services. Following the War regular members of the congregation also included the writer Rose Macaulay and the poet laureate Sir John Betjeman, Poet Laureate from 1972 until his death in 1984. As regular readers will have probably noticed by now, your author is a bit of a tourism geek, and loves to make the most of wherever he finds himself. So what better place to indulge that passion than the Best of Britain and Ireland show at Kensington Olympia this weekend. 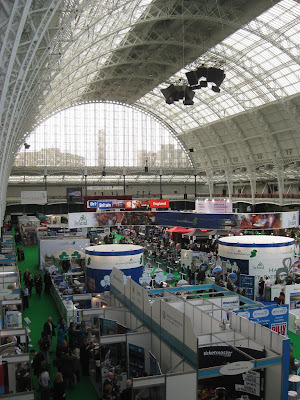 The show gives regional tourist boards and travel operators an opportunity to let you know about what they have on offer and aims to bring together the best of the tourism offering in England, Ireland, Scotland and Wales. If you're looking to make sure you make the most of a domestic holiday later in the year it could be worth a visit. Last year 10,000 people came in search of new holiday ideas, and, we are told, tasted both modern and traditional cuisine and met with (people playing) Henry VIII, Sergeant Pepper, Rabbie Burns and ballerinas from English National Ballet, and that one was at ExCeL. This year it is in the rather more atmospheric setting of Kensington Olympia. Wilkes was recognised as a champion of English Freedom. 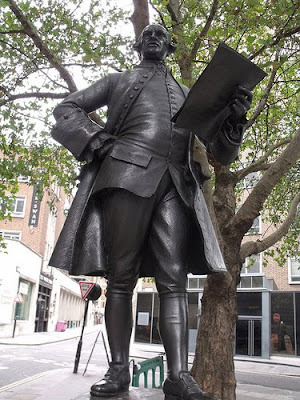 In 1774 he was elected Lord Mayor of London, an in 1776 he introduced the first motion for parliamentary reform. Wilkes was also the first MP to propose universal suffrage in the Commons and during the American War of Independence Wilkes he took the forward step of even condemning British policy on America. He argued for yearly elections and called for the abolition of rotten boroughs, and it is even said that he established freedom of the press as we know it. 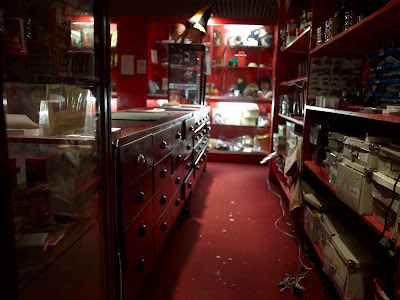 Pollocks Toy Museum began in 1956 in a single attic room at 44 Monmouth Street, near Covent Garden, where Pollock's Toy Theatres were also sold. It takes its name from Benjamin Pollock, the last of the Victorian Toy Theatre printers, and was established by Marguerite Fawdry, who bought up the stock of Benjamin Pollock Ltd, after trying to buy something for her son’s toy theatre. This woman clearly had means. 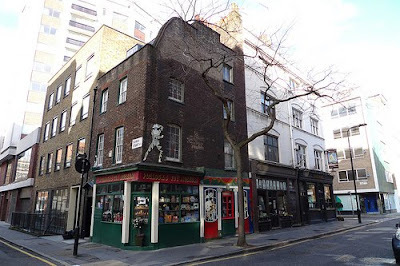 Pollock's moved to Fitzrovia in 1969, where it now occupies two houses on Scala Street, one dating from the 18th century, and the other from the 19th, with rooms are small and connected by narrow winding staircases. The museum claims to have nearly every kind of toy imaginable from all over the world and different periods, including toy theatres, teddy bears, wax and china dolls, board games, optical toys, folk toys, nursery furniture, mechanical toys and doll’s houses. 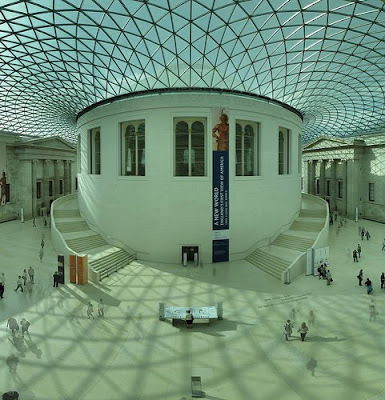 The central court of the British Museum was redeveloped to a design by Norman Foster and Partners in the late 1990s. It reopened in 2000 as the Queen Elizabeth II Great Court. The original court was designed to be a garden, but in the 1850s the Reading Room and a number of bookstacks were built in the courtyard to house the library department of the Museum and the space was lost. It wasn't until 1997, when the Museum’s library department was relocated to the new British Library on Euston Road that the opportunity arose to re-develop the court. The court now houses ticket desks, gift shops, a bar and cafe and a lot of very pleasant space for milling around. On late openings, bands sometimes play and there are also twelve sculptures from the Museum collection, spotted around, including one of King Ashurnasirpal II or Assyria, two obelisks of the Egyptian King Nectanebo II and a pair of Chinese guardian figures. The tessellated glass roof was designed by Buro Happold, and is made up of 1,656 pairs of glass windowpanes. The whole court project cost £100 million and was supported by grants from the Millennium Commission and the Heritage Lottery Fund. For more on the Great Court, see here. 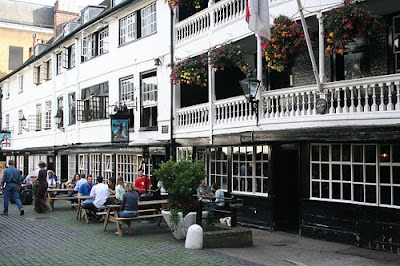 The George Inn, on George Inn Yard, just off Borough High Street, is London's only remaining galleried coaching inn, and dates from the 1670s, when it was rebuilt after a devastating fire swept through Southwark. The George was one of many coaching inns in the area, as it was from around here that the Roman highway Watling Street left London for Canterbury (for pilgrimage) and the sea ports beyond (for the continent). One of the most famous, The Tabard, was chosen by Chaucer for the beginning of The Canterbury Tales in 1388. Watling Street was the main road through South East England for thousands of years, and these coaching inns served as a setting off point for those who could afford horse-power. Later, The George was one of the many famous London hostelries where Charles Dickens chose to wet his whistle, and it was mentioned in Little Dorrit. Shakespeare was allegedly another visitor, coming from the Globe Theatre a short distance away. In more recent times, we are told that the Great Northern Railway used the George as a depot and pulled down two of its fronts to build warehousing. Whilst only the south face remains, it does appear to have survived better than any other example, so perhaps there is reason to be thankful for the railway usage. The pub is now owned and protected by the National Trust, and run by a private company. There's something about boat pubs which particularly appeals to your author, and that's why he liked the Tamesis Dock, in Vauxhall. Formerly known as The English Maid, the Tamesis Dock is a converted 1933 Dutch barge, which is now used as a pub and restaurant. 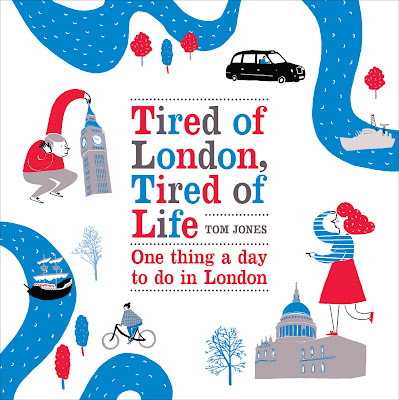 The quality of the food and drink offering isn't particularly great, and it's a bit rough around the edges, but the views, taking in the Houses of Parliament, Millbank Tower, the Tate Britain and MI6 make it worth popping in to waste half an hour if you're in the area. Beside the Old Royal Naval College in Greenwich, an obelisk commemorates the French, Joseph Rene Bellot. Bellot is noted for taking part in two unsuccessful expeditions to try to rescue Sir John Franklin, who had died trying to find a water route around the North side of the American continent. Both expeditions failed to find Franklin, but they did make other discoveries, including a piece of water now known as the Bellot Strait. 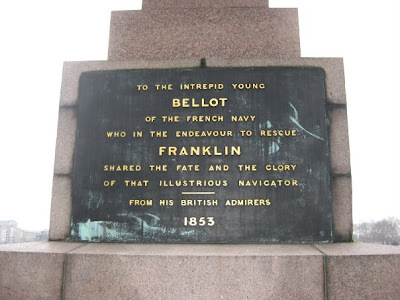 During the second expedition he took part in, Bellot was separated from the rest of the group, fell through the ice in the Wellington Channel and died. £2,000 was raised from mourners after his death and £500 of that was spent on the memorial, designed by Philip Hardwick, who also designed the Euston Arch. In 1935 a crater on the Moon was also named Bellot in his honour. Severndroog Castle is a folly which was built in 1784 as a memorial to William James of the East India Company. A 63ft high Gothic-style castle in Castle Wood, South London, it is on English Heritage's 'Buildings at Risk' register. It was apparently built to commemorate the 'conquest of the castle of Severndroog off the coast of Malabar' in the 1760s, and passed through many owners before being acquired by London County Council in 1922 and closed in 1986. During the Second World War, as it occupied the highest point between London and Paris, it was also manned 24/7 by observers, watching for air raids. 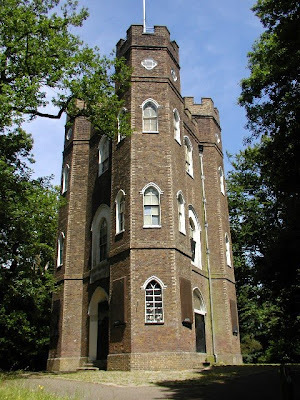 The Severndroog Castle Building Preservation Trust was formed in 2003 to save the Castle from being sold off to private developers, and became a charity in 2008. 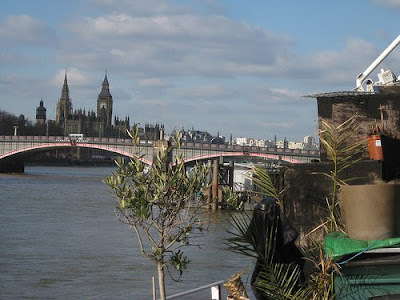 The charity aims to restore the castle and open it as a cafe and venue for educational visits, weddings and also install a viewing platform, to attract visitors and allow them to enjoy its views across London, where apparently seven different counties are visible on a clear day. The Waterloo Action Centre was built in 1893 as a public library. 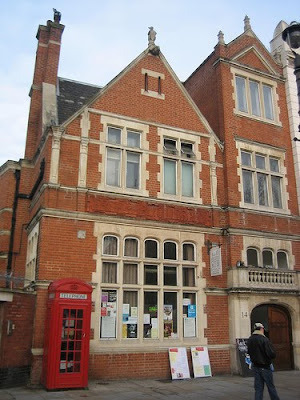 Nowadays it is one of London's most central community centres and, conducting a range of classes, groups, offices. It is such a multi-purpose venue that it even an art gallery, available for hire. A survivor of the Second World War, it had fallen into disrepair by the 1960s and closed down, remaining empty for a decade. In the 1970s, local groups came together to look at what could be done for Waterloo, and took on the centre on a peppercorn rent. 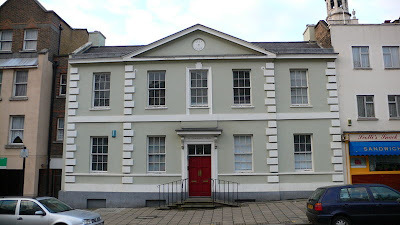 A community charity, Waterloo Action Centre, eventually took over the management of the premises and the Centre was born. Nowadays, there is a full calendar of events at the centre, including Samba classes with the London School of Samba, line dancing, Tai Chi, Pilates, art classes, a Rock Club, church services, and even legal advice and advice on healthy eating. If you're at a loose end they're even looking for volunteers. For more on the centre, see http://www.waterlooactioncentre.co.uk/. Davenports Magic Shop was founded in 1898 by Lewis Davenport, a renowned magician and music hall performer. The business has remained in the same family ever since and today it is managed by Lewis's great-grandson, Bill Davenport. Two of your author's closest friends recently took lessons at Davenports and it is under their recommendation that it is included here. The shop, hidden away in the Charing Cross underground arcade, adjacent to the tube station, has a studio where the various magical activities are held, from lectures by visiting magicians to magic courses. Davenports shop sells a vast array of magic tricks, books, DVDs and accessories for magicians of all levels, and passionate staff who know their trade. The popular beginners Saturday magic course, which guides new starters through basic moves and tricks, and important background, runs regularly in groups of six to sixteen people. An intermediate course is also set to start soon. The next rounds of both courses begin in April. It's been covered brilliantly months ago on other London blogs but it always takes your author a while to catch up, so today's idea is the View Tube, overlooking the Olympic site. In typical Olympics fashion, the largely-empty expensive-looking website can't just say it's a cafe with a nice view of the building site, it has to be 'a social enterprise and community venue located on The Greenway adjacent to the Olympic Park', but your author is pretty sure it was mainly a cafe with a nice view when he popped by on Sunday. 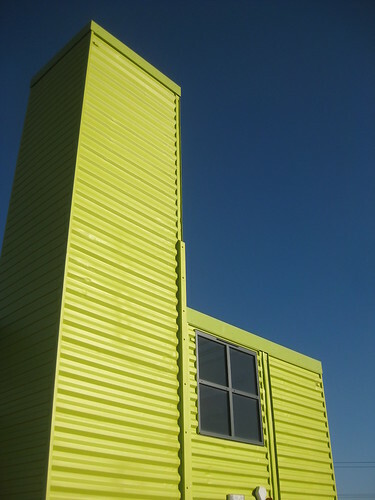 Made from bright green recycled shipping containers, it's a partnership project between Leaside Regeneration, London Thames Gateway Development Corporation, the Olympic Delivery Authority and Thames Water. Whilst the website is plastered with words like 'events', 'create', 'learn' and other meaningless terms, there doesn't seem to be a huge amount to do other than drink tea and look at the view, but it does seem that you might be able to hire a bike for about a fiver and from here you can ride for absolutely miles along the Greenway (to Beckton) or along the Lee Valley, which sounds like great fun, and it's a sport. Oh, and also there is a cafe with a nice view of the Olympic site there. Bit of a niche one this, and not something that will be familiar to your author's readers abroad, but let's look at 2 Lock Keepers Cottages, Old Ford Lock, London E3 2NN, an East London house which was the centre of Channel 4 Breakfast TV for ten years from September 1992 until March 2002. Built in 1947, as housing for the lockkeepers, toll takers, and navigation operators of neighbouring Old Ford Locks, the houses are Grade Two listed and had remained unused for about twenty years until the Big Breakfast acquired them in 1992. They now sit in the shadow of the Olympic site, just 200m from the Stadium, and were purchased in 2005 by the Olympic project under a Compulsory Purchase Order for the Games, leading many to assume they would be demolished. However, they still stand and outline plans seem to show the cottages and gardens will remain. Since the Big Breakfast finished, the house has been renovated, but some of the well-recognised aspects of the show remain, including the swimming pool at the rear. More recently the house has apparently featured in BBC Two's Neneh and Andi Dish It Up, BBC Three's Singing With the Enemy, and ITV's Too Fat To Toddle. 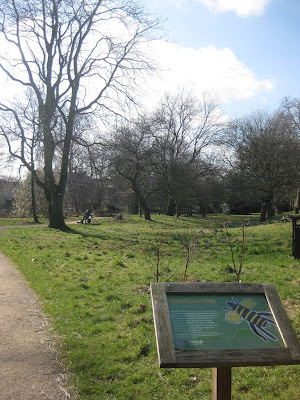 Just a short walk from Baker Street tube, on the South West side of Regent's Park, the Regent's Park Wildlife Garden was constructed in 2006-7 by the 'Wild in the Parks' team. It is a community garden, designed, constructed and planted with help from local schools, community groups and volunteers. The garden aims to demonstrate how you can encourage and support wildlife in your own urban garden, even if it is only small, or if you don't even have one. On the opposite side of the Wellington Arch from the Australian War Memorial, and not completed until November 2006, the memorial was designed by architect John Hardwick-Smith and sculptor Paul Dibble. 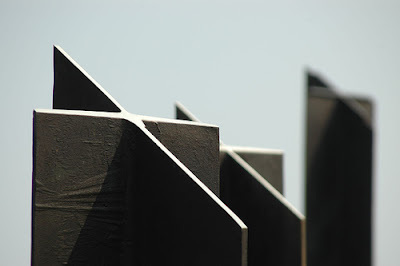 Known as The Southern Stand and is made up of 16 large bronze crossed shaped pieces called ’standards’. The 'standards', all different sizes and weighing up to 700kg each, are set in the ground at an angle and face south towards the Southern Hemisphere. Six of them make up the shape of the Southern Cross. How indie do you think you are? Well however much it is it's not as indie as these guys. 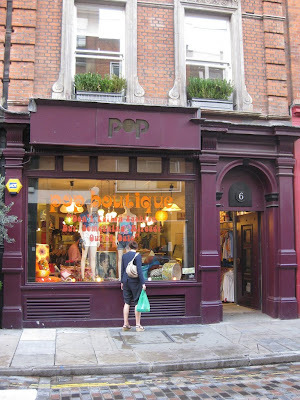 Pop Boutique began in Manchester in at the 1994, and opened in London in 1996 at 6 Monmouth Street, Covent Garden. The shop sells vintage clothing, accessories, furniture, vintage vinyl and kitch. The Pop label has now spread to Liverpool, Leeds, and Gothenburg, and they also sell Pop goods to independent shops in Europe and Japan. They seem to make a point of their employees' love of vintage stuff and that's probably how they get such nice things, all ethically sourced etc etc. We saw last week what a hotbed of communism Clerkenwell has been through the ages, and the Marx Memorial Library is another example. Located at 37a Clerkenwell Green, it is home to a huge archive of books , documents and pamphlets, amounting to around 40,000 volumes covering leftist subjects like Marx, Engels, Lenin, the History of Socialism and the British Labour Movement. Opened in 1933, the 50th anniversary of Marx's death, the building has a history of radicalism and has hosted a range of radical organisations, including the British Social Democratic Federation, which brought Lenin there to use the publishing operation. Lenin's office, used when he was in exile in London in 1902-3, has been preserved for modern visitors. 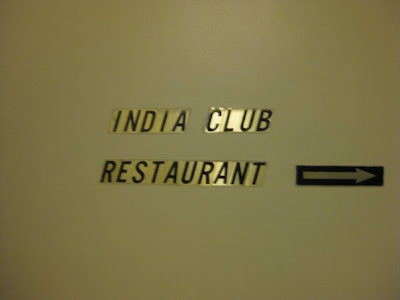 It turns out it's been nearly a year since your author visited the India Club Restaurant on the Strand, so it's about time it got a mention here. Londonist reports they opened in 1939 next to Charing Cross before moving to the current premises on the Strand in the 1950s, and your author has no reason to doubt that. The restaurant doesn't seem to have changed much in recent times and the food is so average it has clearly made its main trade from being near to India House, which sits across the road. Having said that, your author has never had a more authentic Indian restaurant experience outside the Indian Subcontinent, in an absolutely charming but not necessarily gastronomic way. Situated up a winding staircase in the Hotel Strand Continental (which isn't even really a hotel), the restaurant is largely unmarked and consequently from the outside it is pretty tough to find if you're not looking. All this, and when your author visited the staff didn't seem that happy to see him. Pleasantly abrupy staff and floors of blank hotel staircases to get to a small, dark restaurant where they serve you things you vaguely recognise from your local Tandoori, but which aren't really the same. If you squint you could be in the Trivandrum bus station branch of the Indian Coffee House, or in a hotel restaurant in the Delhi backstreets. Your author hasn't mentioned a Sam Smiths pub for some time, so let's end the drought with a look at the Cittie of Yorke, on High Holborn, a Grade II listed inn on a site that dates back to 1430. The current pub was largely rebuilt in the 1920s but it is still a warren of different rooms and alcove and the cellar bar is particularly atmospheric, though the high ceilinged main bar, known as the Henekey's long bar, is well worth a look. The pub is listed in CAMRA's national inventory of historic pub interiors and features include a late-Georgian or Regency era metal stove and Victorian cubicles, which we are told were were originally used by lawyers in consultation with clients (and probably still are from time to time). 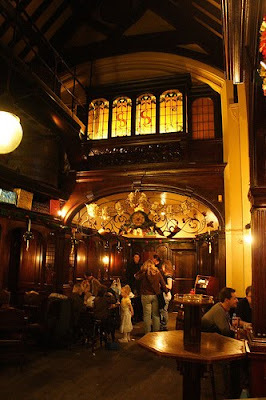 For more on the Cittie of York, see here. It's always natural to react against your parents and that is why your author has always been sceptical about the joys of bird watching. 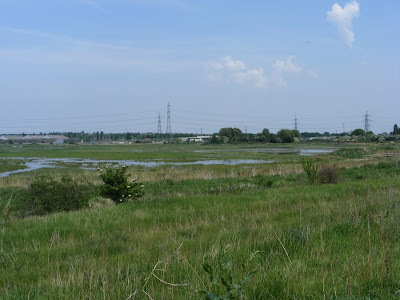 Having said that, they do put these birding reserves in some very picturesque places and Rainham Marshes, on the North side of the Thames where it begins to widen out towards the sea at Purfleet, is a prime example. One of only a handful of ancient landscapes in London, the medieval marshes were closed to the public for over a century and used as a military firing range. It was only in 2000 that the Ministry of Defence gave it up, and it was acquired by the RSPB. In 2006 it finally opened as a nature reserve, offering a chance for Londoners to experience its Medieval landscape, and wildfowl-rich wetlands. From its new visitors centre or from its boardwalks you can look out across the marshes to see wild ducks in winter or breeding wading birds in spring and summer. We are told that birds of prey and rare birds are regularly seen too. It also has one of the densest water vole populations in the country and has been known to attract a Sociable Lapwing, which is apparently like gold dust to birding people.